Have you been diagnosed with an anxiety disorder, or do you suspect that you have one? If so, this audiobook can change your life. You should see a (costly!) therapist. This disorder can't be cured, only treated. Treatment takes months or years before any relief can be achieved. You'll probably suffer from this disorder for the rest of your life, to some degree or another. This problem is genetic, so you can't really fix it. The reason you're so anxious is because of your lack of social skills. You don't have a disorder, you're just shy. Just get out there and meet people, it's easy! The best solution is the current really Astoundingly popular therapy, but it will still take years to get rid of your symptoms. I tried meditation and it helped a little, but my problem is still there. You have to "feel the fear and do it anyways" to be successful. You need to slowly expose yourself to scary situations in order to get over your anxiety. Your anxiety requires daily medication, which won't even get rid of all of it. Your best bet is to learn coping strategies to compensate for the fact that you'll always have anxiety around other people. You should look into careers that will let you work alone. You should just accept the fact that you'll never be in a successful romantic relationship. When I suffered from avoidant personality disorder, these are the types of suggestions that I saw and heard everywhere. But none of them helped me overcome my disorder. After years of suffering, I finally found a permanent solution to AvPD. I discovered and utilized a specific self-help technique that allowed me to dismiss anxiety directly from my mind, from the comfort of my own home. As a result, my avoidant personality disorder was cured. In How to Dismiss Anxiety, I explain the reason why you experience anxiety and how to get rid of it the same way that I did. There is no need for years of expensive therapy anymore. 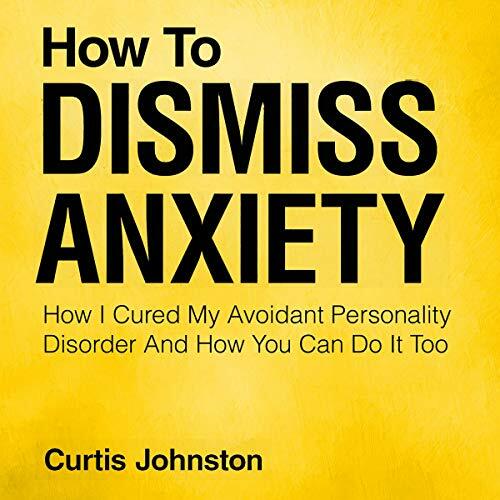 With the knowledge shared in this audiobook, you can rid yourself of social anxiety for free. book is just an hour long anecdote. not based on science. i dont recommend it.